Urtzi Grau is an academic, architect and founder of Fake Industries Architectural Agonism (FAAA) together with partner Cristina Goberna. 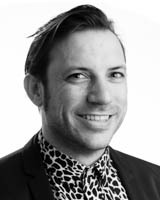 At UTS, Urtzi is director of the Master of Research at the School of Architecture. Urtzi graduated from the School of Architecture of Barcelona in 2000 and was awarded Master of Science in Advanced Architectural Design by the Graduate School of Architecture Planning and Preservation, Columbia University (GSAPP) in 2004. He is currently completing his PhD at Princeton University School of Architecture on the 1970s urban renewal of Barcelona. Urtzi has taught studios at Cooper Union, Princeton University, Columbia University and Cornell University. His work and writings have been published in different international journals such as Architect's Newspaper, AV, Bawelt, Domus, Kerb, Plot, Praxis, Spam, Volume and White Zinfadel. He has exhibited in the Buenos Aires Biennale, P! Gallery, Shenzhen Biennale, Storefront, the Venice Biennale, and 0047. Fernandez-Abascal, G & Grau, U 2018, 'Driverless Vision: Towards a Sensorial Agreement', Plat, vol. 7, pp. 257-268. This house comes from a cross between several imaginaries: the traditional house and the modern house; local technique and industrial technology; the winter house and the summer house; Le Corbusier's Maison Jaoul and Craig Ellwood's Stahl House; everyday life in the countryside and global media exposure. Starting from these crossings, the project consistently negotiates these imaginaries giving birth to a completely unprecedented result. Grau, U & Goberna Pesudo 2016, 'First Hypothesis on Production', Place Holder, no. 3, pp. 26-29. Grau, U & Goberna Pesudo, C 2016, 'On the Table', Pool, no. 1. Architecture is probably the one creative field in which the flow of knowledge is least regulated. For instance, compare it to music or cinema in which copyright laws dictate the maximum length of the fragments that can be freely used by others. Think of the legal implications that terms such as plagiarism, quotation, or paraphrasing have in literature. Remember how intellectual property (IP) rights render illegal any transformation of a work of art not sanctioned by its author. Albeit architecture, since 1990, has enjoyed a legal status similar to these other fields, none of these principles sen to apply. In fact, IP regulations remain mostly underdeveloped and rarely enforced. Grau, U & Goberna Pesudo 2016, 'Aldea Moret Mining Village Master Plan'. Grau, U & Goberna Pesudo, C 2014, 'What Kinds of Copies', Log Journal for Architecture, Anyone Corporation, New York. As with any other creative discipline, architecture submits to a regime of originality. Operations having in common the recourse to already produced forms, such as appropriation, détournement, objet-trouvé, mash-up, parafiction--well-known critical tools in a wide range of artistic production--still remain unabsorbed and even taboo. While imitation and reproduction are the obvious roots of the last 20, if not the last 600, years of excess architectural shapes, the field of architecture has resisted openly embracing copies, and in so doing has hindered its own potential. It is important to clarify that the intentional copies we are referring to are not references; they should not be confused with quotations or precedents. They do not establish any link to the lost virtue of ancient civilizations and they do not testify to any particular erudition or affiliate copiers with the great masters of the past. These copies are humbler and less re?ned than direct citations; they simply reemploy knowledge that is already available and public. In this context, to intentionally copy entails a radical reformulation of architectural imagination: it allows for the renunciation of form making--since form is defined a priori--to focus on available architectural knowledge yet to be discovered. Grau, U. & Goberna Pesudo, C. 2009, 'House for Cesar', Young Architects Forum Prize of the Architectural League of New York, -, -. Grau, U. & Goberna Pesudo, C. 2006, 'Trozos', Europan 8, -, -. Grau, U & Goberna Pesudo, 'Casa OE', UNFINISHED, Pabellon Espanol en La Bienal de Venecia, Venice Biennial. Grau, U & Goberna Pesudo, 'The Portable Indo Pacific', 3rd Istanbul Design Biennale, Istambul. Grau, U, Goberna Pesudo & MAIO, 'Curtain Room', Occupy at design Hub RMIT. Grau, U & Goberna Pesudo, C, 'Rooms: No Vacancy', Young Architects Program, The Museum of Modern Art and MoMA PS1, New York. Measure is an exhibition of newly commissioned drawings by 32 international architects presenting 32 edifices of thought. Drawings are of Storefront for Art and Architecture's gallery space on 97 Kenmare Street in New York. Architectural representation, which draws upon the diagram as a conceptual and abstract component, has historically been criticized as obscure and self referential. The proliferation of data visualization in popular media today, however, allows us to engage a much larger audience in conversations about measurement and representation. The 32 drawings presented at Storefront unveil the challenges of representation and extrapolate them onto the architect's table and the gallery walls. Storefront's third iteration of the drawing show seeks to find measures, resist measurement, and measure the immeasurable by presenting drawings that range from the real to the fictional and from the functional to the symbolic. Measure positions the medium and the act of drawing as a process by which we seek coherence in data and representation, and shows that it is the making of facts that is the basis for the production of futurity beyond existing norms. Grau, U & Goberna Pesudo, C, 'Indo Pacific Atlas', Chicago Architectural Biennal, Chicago Architectural Biennial, Chicago Cultural Center. The title of the 2015 edition of the Chicago Architecture Biennial will be The State of the Art of Architecture. What is The State of the Art of Architecture today? More than a profession or a repertoire of built artifacts, architecture is a dynamic cultural practice that permeates fundamental registers of everyday life—from housing to education, from environmental awareness to economic growth, from local communities to global networks. In an age of accelerated change, today's architects, artists, designers, planners, and activists are developing an extraordinary range of visionary ideas that test the limits of these realms of everyday life. As a platform for the creative breakthroughs that are reimagining the ways we inhabit and shape the world around us, the Chicago Architecture Biennial will bring an international and intergenerational network of architectural talent together to explore the ambitions, challenges and possibilities that are fueling the architectural imagination today and steering the future of the field. The State of the Art of Architecture will offer an opportunity to take stock of architectural projects and experiments from around the world, establishing a broad foundation for future editions of the Chicago Architecture Biennial. With an incredible breadth of design approaches, research interests, and cultural perspectives, it will offer a global stage for debate and the exchange of ideas. The exhibition attempts to describe Spain's current situation of fleeting professionals under an analytical yet slightly optimistic point of view. In opposition to the classical enumeration and display of specific works of architecture, the exhibition rearranges numbers, statistics and concrete data in order to reveal the modern-day meaning of 'working abroad' as something much more complex than actual construction and design practice. Grau, U & Goberna Pesudo, C, 'Barcelona Wallpaper and ready made architecture', Treatise: Why Write Alone?, Graham Foundation. Treatise: Why Write Alone? brings together fourteen young design offices to consider the architectural treatise as a site for theoretical inquiry, experimentation, and debate. Organized by Chicago and Los Angeles-based designer Jimenez Lai, the project grows out of a recent Graham Foundation grant to Lai, whose interest in discursive practices and non-conformist approaches to architecture led him to ask his peers working in the realm of conceptual architecture: Why write? And, why write alone? In response to these questions, Treatise presents an exhibition of works by this core group of designers to provide a platform to investigate the collective and individual stakes that emerge from this temporary alliance of designers as they explore architecture's representational limits and possibilities. Today's society has had a profound influence on the discipline of architecture, yet despite the utilization of current technologies, these contemporary works are not divorced from history. Chatter: Architecture Talks Back is about just that—having a dialogue, talking back to architecture of the past. Works from the Art Institute's vast collection of architecture and design are presented alongside these five ultra-current practitioners to highlight this conversation. As these architects apply new technology to a confluence of historical influences and theories in order to conceive new designs and ideas, they are constantly expanding the dialogues within the legacy of their field. This dynamic installation makes readily apparent how each studio recognizes that the architectural past, though a shared language, is sometimes best understood with modern punctuation. Grau, U & Goberna Pesudo, C, 'The Book of Copies', Kopie, Pastiche, Collage.